Hocking Hills is home to many exciting outdoor adventures, but nothing compares to the thrill of our Zipline Canopy Tour! 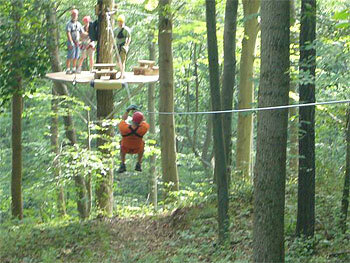 Fast, fun, and exhilarating, this 3 hour spectacular adventure offers thrill seekers of all ages the unique opportunity to zip through the treetops on a network of cables and adventure skybridges suspended high above the forest floor, overlooking a cave, rock cliffs, the Hocking River, and other nature flora. Upon arrival, their guides will give you a detailed safety and equipment orientation before you are fitted with your personal gear for the tour. You will also have the opportunity to actually “zip” on a low training cable to practice the techniques that you will be using on the tour. The adventure then begins! They transport you along a 1.5 mile scenic nature trail to the beginning of the course where the Mighty Oak awaits your arrival. You will complete 10 ziplines, traverse 5 adventure skybridges and rappel back to ground level at the finish line. While waiting between each zip you will enjoy amazing views from the observation platforms. Your guides will point out interesting highlights of the area, including native vegetation, animals, as well as local history. For thrill-seekers and nature lovers alike, it’s the perfect adventure for families, couples seeking to escape the fast-paced city, or adults looking for something new. Designed for guests who are in reasonably good health, our zipline tour is sure to thrill first-time zippers as well as the most experienced zipline enthusiasts. The cost of our tour is $85 per person. Pricing of tour includes all necessary equipment, transportation, and a light trail snack. # Every participant must sign a Waiver and Release Form. Participants under the age of 18 must have a signed waiver by a parent. If the parent is not present, a photocopy of the parent’s drivers license must accompany the signed waiver. # Closed toed shoes are required. # The zipline canopy tour is designed for use by participants of average mobility and strength, and who are in reasonably good health. # Participants should weigh around 70 to 250 pounds, this is a guideline. # The minimum age is 10 years old. Children between the ages of 10 – 15 must be accompanied by an adult, but must be able to participate independently of the adult. # Each participant must be physically able to control the speed of their travel along the zip lines by grasping the cable with leather gloves. # Each participant must be able pull themselves along the zip cable a few feet in the event they lose momentum before reaching any given landing platform. # There is a 500 foot nature walk during the tour on an unpaved trail at an incline of about 10%. Each participant must be able to complete this walk. It is approximately as challenging as climbing two flights of stairs. # Pregnant women, people with heart, leg, or back problems, or other serious illnesses will not be allowed to participate in the tour. 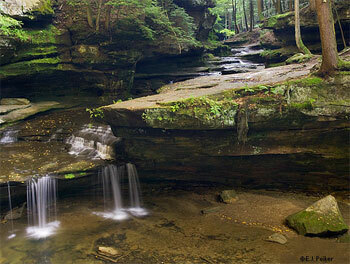 Hocking Hills Canopy Tours is located in Rockbridge OH, just off U.S. Route 33, Approximately 40 miles South-East of Columbus, Ohio. Take U.S. Route 33 South-East toward Rockbridge. Turn left AT Rockbridge, AT THE VALERO GAS STATION. Turn right just past the Valero station, where you will see our sign. Proceed up the hill to the parking area. Check-in at the Clubhouse. Take 664 N to U.S. Route 33. Head west on U.S. 33. Turn right AT Rockbridge, AT THE VALERO GAS STATION, where you will see our sign. Proceed up the hill to the parking area. Check-in at the clubhouse.